Many molecular studies of ion channel function rely on the ability to obtain high quality voltage clamp recordings using the patch clamp technique. For a variety of channel types studied in mammalian cell heterologous expression systems, the lack of experimenter control over expression levels severely hinders the ability to obtain a high percentage of cells with an expression level suitable for high quality recordings. Moreover, it has been nearly impossible to obtain expression levels in mammalian cells well suited for single channel recordings. We describe here the use of an inducible promoter system in a stably transfected mammalian cell line that produces nearly 100% success in obtaining ion channel expression levels suitable for either whole cell or single ion channel studies. We used a tetracycline-regulated expression system to control K+ channel expression in a CHO (Chinese hamster ovary) cell line. Current magnitudes within a reasonably narrow range could be easily and reliably obtained for either macroscopic or single channel recordings. Macroscopic currents of 1 – 2 nA could be obtained in nearly 100% of cells tested. The desired expression level could be obtained within just 2 to 3 hours, and remained stable at room temperature. Very low expression levels of transfected channels could also be obtained, which resulted in a >70% success rate in the ability to record single channel currents from a patch. Moreover, at these low expression levels, it appeared that endogenous channels produced little or no contamination. This approach to controlling ion channel expression is relatively simple, greatly enhances the speed and efficiency with which high quality macroscopic current data can be collected, and makes it possible to easily and reliably record single channel currents in a mammalian cell heterologous expression system. Whereas we demonstrate the ability of this system to control expression levels of voltage-gated K+ channels, it should be applicable to all other channel types that express well in mammalian expression systems. Many molecular studies of ion channel function rely on expression of cloned channels in mammalian cells. These studies usually utilize patch clamp techniques to examine the influence of experimental manipulations on the magnitude, gating kinetics and/or voltage-dependence of ionic currents passing through the channels. Under physiological conditions, cell membrane potentials vary between ~-90 mV and +60 mV. Consequently, studies of ion channel properties depend on the technical ability to accurately record current magnitudes between these membrane potentials. In general, high quality voltage clamp experiments in the whole cell configuration require currents in the range of 0.1 to 2.5 nA. A significant problem with the use of mammalian cells is that expression levels are difficult to control. In transient transfection systems, channel expression levels are marginally controlled by the amount of cDNA used for transfection. In stable transfection systems, plasmids required for heterologous expression are incorporated into the host cell's genome. With stable lines, therefore, expression level is not under experimenter control. Due to this lack of control, expression levels are highly variable and often too high. For example, in HEK cells (human embryonic kidney cells, one typically used cell line) transiently transfected with potassium channel cDNA, ionic currents in cells from a single transfected population can range from 0 to >20 nA within the membrane potential range of interest. In our experience, when adequate amounts of cDNA are used to promote a reasonable transfection efficiency, 4 out of every 5 cells examined have currents larger than 2.5 nA at a membrane potential of interest. Thus, the practical result of this lack of control is that only 20% of examined cells can be relied upon to give accurate voltage clamp data. In stable cell lines, potassium channel expression levels often result in currents in the 5 to 10 nA range at 0 mV. This precludes quantitatively accurate voltage clamp recordings. Moreover, the complete lack of control over expression in stable lines makes it impossible to obtain the range of expression levels required for different types of experiments. This lack of control, in both transient and stable transfection systems, significantly hinders experimental progress. A second problem that results from the lack of control over expression in mammalian cells is that it is extraordinarily difficult to perform studies of single ion channel currents. Single channel studies reveal important mechanistic information about channel gating that is impossible to obtain from examination of macroscopic currents. However, even at moderate expression levels, channel density is too high to obtain just one or two channels with a patch electrode of reasonable resistance. What is needed to solve both of these problems is a technique that allows the experimenter to reliably generate cells that express channels at a density appropriate for a particular experiment. Because experimental needs can vary daily, an ideal solution would include the ability to control expression levels on a daily basis. We report here the use of a simple method to reliably control ion channel expression on the day of recording. With the use of an inducible promoter system in a stable cell line, 100% of cells express channels over a very narrow, experimenter-chosen range of densities. Most importantly, expression can be held at 1) levels that produce current magnitudes appropriate for macroscopic current recordings or 2) a level that results in a channel density of less than one per square micron of cell membrane, which greatly facilitates the recording of single channel currents. The chosen method had to accomplish four goals. First, channel expression levels had to be controlled within a reasonably narrow, desired range. Second, different ranges of expression had to be easily obtained. For example, a very low expression level is needed for recording single channel currents, a mid-range of expression is needed for macroscopic currents, and high expression levels are needed for gating current measurements. Third, any desired expression level had to be achieved on a day's notice. Finally, to facilitate scientific progress, it would be ideal if ~100% of cells expressed currents within the desired range. To accomplish all of these goals, we produced stable mammalian cell lines with channel expression under the control of an inducible promoter [1–4]. Any cell line that is good for heterologous expression would be suitable for creating a stable cell line. In addition, the cell line of choice must be amenable to the inducible promoter system being used (c.f. ). We used CHO (Chinese hamster ovary) cells due to the extremely low expression level of endogenous ion channels . We purchased T-REx-CHO cells from Invitrogen Corp. (Carlsbad, CA). These cells are stably transformed with the pcDNA6/TR vector, which contains the tetracycline (Tet) repressor gene. We further transformed these cells with a pcDNA4/TO vector, which contained 1) a CMV promoter with two copies of the Tet operator 2 sequence, and 2) the cDNA encoding the channel gene of choice ligated into the multiple cloning site. Channel expression levels were then under the control of a competition between constitutively expressed Tet repressor protein and exogenously added tetracycline. In the absence of Tet, the Tet repressor protein is bound to the Tet operator and expression is prevented. Incubation of cells with Tet results in the displacement of the Tet repressor protein from the Tet operator, and expression occurs. Time-dependent increase in channel expression with Tet incubation. Currents were recorded from CHO cells stably expressing the Kv2.1 channel. (A) Peak whole-cell current magnitude, evoked by depolarization to 0 mV, is plotted as a function of the duration of Tet incubation, which began at time 0. (B) Same as in A, except that the current magnitude was normalized to cell size, as determined by whole cell membrane capacitance. The insets in each panel illustrate the mean current values (± S.E.M., n = 3 – 12) at selected times during the first 180 min. In the experiment illustrated by Fig. 2A, cells were incubated in Tet for 250 min and then removed from the incubator and placed in recording media. Cells were tested for current expression immediately and every few minutes for ~80 min. These data demonstrate that once cells were removed from the incubator and placed in recording media at room temperature, channel expression levels remained constant (Fig. 2A). This is of some practical significance, as this means that one need not rush to record once channels are removed from the incubator. In contrast, the increase in channel expression continued if Tet exposure was discontinued but cells were maintained in the 37° incubator (Fig. 2B). 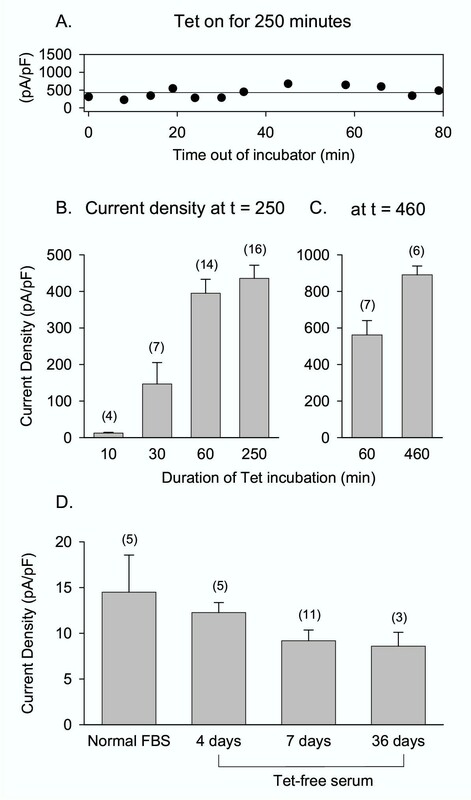 Thus, whether cells were exposed to Tet for 60 min or 250 min, current density recorded at 250 min was identical (Fig. 2B). This is also convenient, as it demonstrates that channel expression can be tightly controlled without the experimenter having to worry about removing the Tet from the cells at a precise time. If, however, experiments are to take place for more than ~4 hours after the initiation of Tet incubation, the duration of Tet exposure will influence current density at the time of recording. For example, 460 minutes after initiation of Tet incubation, cells had a higher expression level if Tet exposure was maintained rather than terminated after just 60 min (Fig. 2C). Practically speaking, these results suggest that for a full day's worth of experiments, control over expression will be better maintained if Tet incubation is initiated at least twice. Long-term effects of Tet incubation on expression. (A) Cells were exposed to Tet in the incubator for 250 min, then removed from the incubator and kept in recording solution at room temperature. Recordings were made from a series of different cells over a period of 80 min to determine current density. The horizontal line is drawn at the mean density over the complete set of data. (B) Current density was determined at t = 250 min following the Tet incubation times shown on the abscissa. Values in parentheses denote the number of cells tested. (C) Current density was determined at t = 460 min following the Tet incubation times shown on the abscissa. (D) Cells were maintained in media containing no added Tet, plus either normal fetal bovine serum (FBS) or Tet-free serum for the number of days indicated on the abscissa. Thirty minutes appeared to be the borderline duration of Tet incubation required for initiation of expression (Fig. 2B). After a 30 minute incubation with Tet, 3/7 cells expressed no current at all above background. In contrast, after exposure to Tet for 60 minutes or more, 100% of cells expressed a current level above background. A potential problem for single channel recordings is a finite, albeit low level of expression of endogenous channels in the cell line being used. Indeed, we have never observed endogenous, voltage-gated K+ currents in CHO cells. Nonetheless, in Fig. 3, we used functional tests to determine whether the current that remained following prolonged incubation in Tet-free medium was predominantly from endogenous channels, the transfected channel, or a mix of the two. We used two well-characterized functional assays on two channels, the wild type Kv2.1 potassium channel and a mutant Kv2.1 channel that had two outer vestibule lysines neutralized (Kv2.1 K356G K382V). 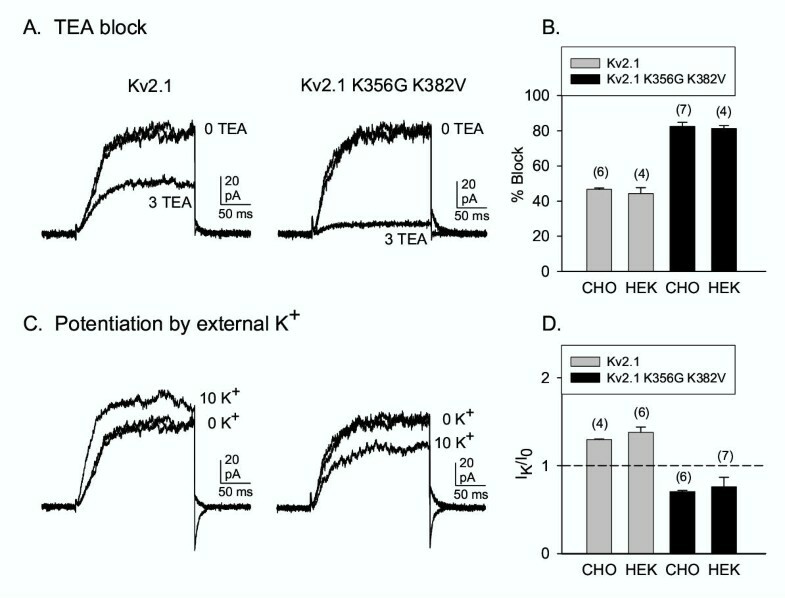 These two channels display different sensitivity to the extracellular channel blocker, tetraethylammonium (TEA)  and display different responsiveness to elevation of external [K+] . When over-expressed in HEK cells, these two channels are blocked by 3 mM external TEA by ~44% and ~81%, respectively (; Fig. 3B). The TEA block of current in CHO cells after prolonged incubation in Tet-free medium was statistically identical for the respective, stably expressed channels (Fig. 3A,3B). Similar results were obtained for the K+-dependent change in current magnitude. When expressed in HEK cells, currents through Kv2.1 are potentiated by elevation of external [K+] (; Fig. 3D). In contrast, currents through the mutant channel are reduced by the same elevation of external [K+] (; Fig. 3D). 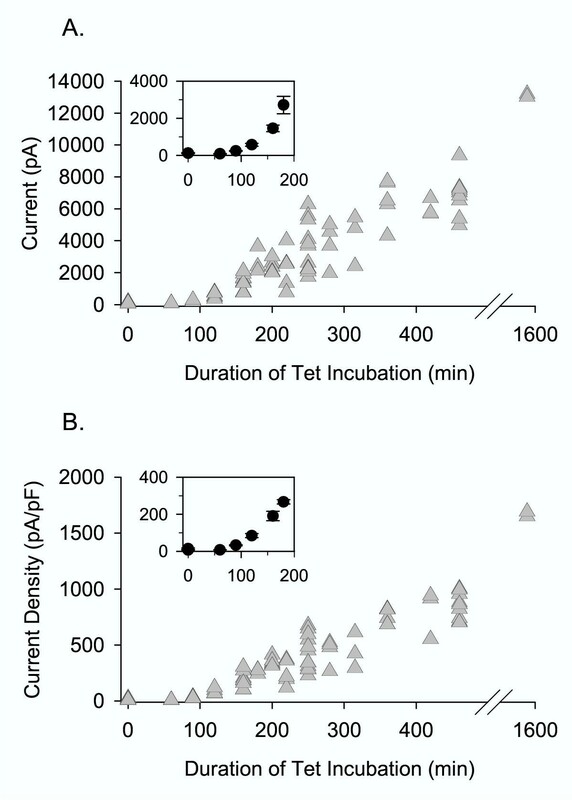 The currents in CHO cells after prolonged incubation in Tet-free medium responded to [K+] elevation in a quantitatively identical manner (Fig. 3C,3D). These data demonstrate that the vast majority, or perhaps all, of the current observed in Tet-free conditions, which was produced by fewer than 100 channels in the entire cell membrane, was carried by the transfected channel. K + currents in Tet-free conditions were carried by the transfected channel. Currents illustrated in panels A and C were recorded from CHO cells maintained in Tet-free media for 7 days. (A) Block of wild-type Kv2.1 and the channel mutant, Kv2.1 K356G K382V, by 3 mM TEA. The two traces in 0 TEA illustrate the control and recovery currents. (B) Mean block by 3 mM TEA in the two channel types, expressed in CHO cells exposed to Tet-free media for 7 days and in HEK cells, transiently transfected with channels. (C) Currents recorded from cells containing Kv2.1 (left) or Kv2.1 K356G K382V (right), in control solution (0 external K+) and following addition of 10 mM external K+ (equimolar substitution for NMG). (D) Mean change in current magnitude, normalized to the control current, following application of 10 mM external K+. In the experiments utilized for panels B and D, the mean current amplitude in CHO cells in 0 mM external K+ was 75 ± 13 pA (n = 10); current magnitudes in HEK cells ranged from 1 – 6 nA (data from  and ). As described above, one of the primary goals of this approach was to achieve expression levels suitable for recording single channel currents in mammalian cells. Fig. 4A and 4B illustrate the problem to be solved. Our standard low resistance patch clamp pipet, which has good electrical properties, and which we would use for whole cell recordings, has a tip diameter of ~0.8 -1 μm. Fig. 4B illustrates a recording with a low resistance pipet from a cell-attached patch on a cell expressing Kv2.1 K356G K382V. This cell was incubated with Tet for 120 min. Shortly after this recording was made, the membrane patch was ruptured, and the whole cell current illustrated in Fig. 4A was recorded. Clearly, even at expression levels that resulted in whole cell currents of just 200 pA (current density ~30 pA/pF), it would be impossible to conduct a comprehensive study of single channel behavior. In contrast, the lower current levels achieved with Tet-free media are ideal for reliably recording single channel currents with low resistance pipets (Fig. 4C). In 51 cells examined thus far, 36 cells displayed either 1 or 2 single channels in a patch. Recording single channel currents from cell-attached patches. (A) Whole cell recording from Kv2.1 K356G K382V after 120 min incubation with Tet. Current was recorded with an external solution containing 100 mM K+ and a pipet solution containing 0 K+. (B) Just prior to rupturing the patch for the recording in panel A, current was recorded across the membrane patch in cell-attached mode. (C) Cell-attached patch recording of a single ion channel from a cell maintained in Tet-free media for 44 days. Channel opening is in the upward direction. The data in Fig. 3 demonstrated that few, if any, endogenous voltage-gated K+ channels were present in the stable CHO cell lines. Three observations strongly indicated that single channel currents obtained from stably transfected CHO cells also represented exclusively the transfected channels. First, previous whole cell recordings demonstrated that, when normalized for channel number, current magnitude in wild type Kv2.1 was half that of the mutant Kv2.1 channel . The single channel data obtained from the stably transfected CHO cells were consistent with these results. At 0 mV, in the presence of 0 mM external K+, single channel current magnitude in CHO cells containing wild type Kv2.1 averaged 0.35 ± 0.02 pA (n = 3). In cells containing Kv2.1 K356G K382V, single channel current magnitude averaged 0.72 ± 0.01 pA (n = 3). Second, under a variety of different experimental conditions, populations of cells transfected with either of the two channels displayed single channel conductances that varied by 5% or less (data not shown). Third, in patches with multiple channels, all single channel events displayed identical conductances. Thus, whereas care must always be taken, it appears that this system allows for the reliable recording of single channel currents from transfected cells with a low probability of contamination from endogenous channels. For functional studies of cloned ion channels, two expression systems are commonly used. In one, Xenopus oocytes are transfected by injection with mRNA. In general, channel expression levels in oocytes can be controlled appropriately for both macroscopic and single channel recordings. Many investigators, however, choose to use mammalian cells as the heterologous expression system of choice. While there are a variety of advantages to mammalian cells for this purpose, standard transfection procedures, which involve the introduction of cDNA into the cell, provide only marginal, and often unsatisfactory, control of expression levels. With the Tet-on inducible expression system in CHO cells, we were able to control macroscopic current magnitude within a very narrow window, over a large range of expression levels. With the appropriate exposure to Tet, currents could be obtained within an ideal range for whole cell patch clamp recording in essentially 100% of cells. When maintained in Tet-free media, cells expressed a low level of current, which was derived, perhaps entirely, from the stably transfected channel. This low level of expression was well-suited for recording currents through single channels in the cell-attached mode with low resistance patch pipets. The ability to control current magnitude at different levels solves two serious problems for patch clamp studies of ion channels expressed in mammalian heterologous expression systems. First, in whole cell studies, it dramatically increases productivity by increasing the percentage of cells that can be well clamped. Second, the ability to hold current density very low allows for the recording of single channel currents from mammalian cells, a nearly impossible task when uncontrolled expression techniques are used. Moreover, a relatively high percentage of recordings under Tet-free conditions yielded cells with 1 or 2 channels in a patch, which makes the ability to record single channel currents from the channel of choice, expressed in mammalian cells, routine. Stable cell lines were made for two voltage-gated K+ channels, wild type Kv2.1 and a mutant channel derived from Kv2.1 (Kv2.1 K356G K382V). For each channel type, 10 of ~40 cell foci that remained following transfection and exposure to antibiotics were selected and expanded. Four of the ten cell cultures for each channel were then tested for Tet-inducible channel expression. Seven of these eight cultures displayed Tet-induction, and displayed similar macroscopic current magnitudes in both the absence and presence of tetracycline. Stable cell lines were kept under selective pressure by blasticidin (pcDNA6 contained the blasticidin resistance gene) and Zeocin (pcDNA4 contained the Zeocin resistance gene). Cells were maintained in a CO2 incubator (37°C, 8.5% CO2) in Ham's F12 media containing 10% fetal bovine serum (FBS; Hyclone Laboratories, Logan, UT), 1% penicillin-streptomycin, 10 μg/ml blasticidin and 250 μg/ml Zeocin. In some experiments, cells were maintained in Tet-free FBS (Hyclone Laboratories). Tet-free FBS contained < 300 pg/ml of Tet, determined by ELISA assays (Hyclone Laboratories). Normal FBS was unscreened for Tet. To initiate expression, Tet was added to the maintenance media at a concentration of 1 μg/ml. Expression levels were controlled by the duration of Tet incubation, as described in the Results section. Channel expression was determined using standard whole cell patch clamp recordings, as described previously . Briefly, cells were removed from the incubator, and incubation media was replaced with a bath solution containing, in mM: 145 N-methylglucamine (NMG), 2 CaCl2, 1 MgCl2, 10 HEPES, 10 glucose, pH adjusted with HCl to 7.3, osmolality 330. The intracellular solution contained, in mM: 100 KCl, 35 NMG, 10 EGTA, 4 MgCl2, 1 CaCl2, 10 HEPES, pH adjusted with HCl to 7.3, osmolality 290. Once seal formation was achieved, cells were superfused by constantly flowing bath solution. Cells were clamped at a holding potential of -80 mV and currents activated by depolarization to 0 mV. In Fig. 4B and 4C, currents were recorded in the cell-attached patch configuration. In these experiments, the pipet contained intracellular solution, except that 100 mM NMG-Cl was substituted for KCl. The bath solution had 100 mM KCl substituted for NMG-Cl. This held the whole cell resting potential near 0 mV (data not shown), which enabled us to know the membrane potential across the patch. In cell attached patches, the pipet potential with respect to ground was held at +80 mV, and channels were activated by stepping the pipet potential to 0 mV. All currents were filtered at 2 KHz (Axopatch 200B amplifier, Axon Instruments, Union City, CA) and digitized at 10 KHz for whole cell recordings and 20 KHz for single channel recordings (pClamp 9, Axon Instruments). Recording pipets were fabricated from 8250 glass (Garner Glass, Claremont, CA), coated with Sylgard and firepolished. Pipet resistance was between 1.5 and 2.0 MΩ. This work was supported by NIH NS41090. The authors jointly conceived of the idea for this study and both contributed to the experimental design and analysis. JGT carried out the molecular biology manipulations, performed the electrophysiological experiments, and contributed to the writing of the paper. SJK wrote most of the paper.